The most accepted terms for this field are Animal-Assisted Therapy (AAT) and Animal-Assisted Activities (AAA). AAT involves working with someone when a specific goal has been identified. If you do this as a volunteer, you will work with a professional who will assist you in selecting goals for different individuals. AAA are those activities designed to strengthen someone's quality of life. Usually performed by volunteers, they are generally "meet and greet" activities. Chandler Rudd of Hampton Falls rescued Lucy, his Golden Retriever, who now works with people with disabilities. Lucy was born with spina bifida four years ago and abandoned at 5 weeks and Rudd adopted her. Staff photo by Carrie Niland. His compassion towards both people and animals facing difficult challenges has led Chandler Rudd to touch lives in a unique way. Rudd, who serves as transportation director for the Yankee Golden Retriever Rescue in Hudson, Mass., reaches out to the elderly, the disabled and the ill through his beloved pets, which are also internationally certified therapy dogs (Therapy Dogs International TDI). "I've always liked to help people. This is just a different way to do it," says Rudd of his canine partnership. The Hampton Falls resident and his wife Darlene regularly bring their two Goldens, Ben and Lucy, to nursing homes, rehabilitation centers and hospitals. The dogs are used to comfort and inspire. "Some people communicate better with animals than with other people, especially the elderly. A lot of times, the dog brings back memories. Sometimes you can reach people more using an animal, whether it's a dog or a cat," Rudd says. Rudd explains that therapy dogs have been temperament tested to assure that they behave around strangers, particularly the infirm, such as the elderly. They are also certified to be obedience trained in all situations. Training is on-going, Rudd says, adding that Ben and Lucy have been in training since they were adopted. To be certified by TDI, the dogs are required to go through an evaluation conducted by one of their testers. Tasks the dogs are asked to perform include being able to heel on command while walking on a leash, sitting by themselves without their owners for five minutes, remaining calm while loud noises or quick motions are affecting their environments, sitting quietly while being poked, pulled and vigorously rubbed, staying calmly next to a person in a wheelchair and showing no aggression when a strange dog is introduced. TDI also insures all of its members with a $3 million dollar liability insurance policy. Both dogs also have the Canine Good Citizen Certificate (CGC). This shows that the dogs have good personalities and can interact with other dogs and people with a minimum of trouble. Patients can particularly identify with Lucy, whose hind legs are paralyzed as a result of spina bifida. "When they see how happy she is, it really helps them cope," says Rudd. Lucy first became certified through Northeast Rehabilitation Hospital in Salem, where she visits children and adults who have disabilities, recalls her owner. "She seems to connect with kids more than the adults." Darlene Rudd, who is also a YGRR member, adds that animal assisted therapy with Lucy is very positive psychologically. "When someone has lost a limb they may say that they can't do something. Then they took at her (Lucy) and get a whole different outlook." Lucy connected immediately with a 9-year-old boy named Joshua, who also has spina bifida. The two instantly became best friends after Rudd pushed Lucy in a stroller alongside the youngster, who was also in a stroller. Joshua asked Rudd why the dog was in a stroller, and whether she was handicapped. When Rudd told the child that Lucy had spina bifida, Joshua's reaction was, "Oh my G-d! So do I!" 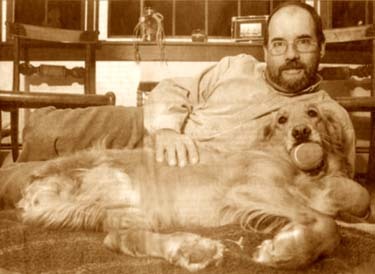 The friendship that developed between the boy and the dog inspired Rudd, who recently won the Treasured Golden Bonds Storytelling Contest run by school psychologist Rochelle Lesser, for his story about the two. "It's one of those things you can't explain," Rudd says. The encounter with Joshua last summer energized Rudd to double his efforts to find more local clients for Lucy to cheer up. Lucy became part of the Rudd family when daughter Susan, who is an intern at Fremont Animal Hospital, told her parents about the physically challenged dog who had been abandoned. She pleaded with them to take Lucy into their home temporarily to housebreak her and socialize her with their two Goldens, Maggie and Bennie. Susan informed her mother and father that since everyone had classified Lucy as unadoptable this would be her last chance. The recommendation was for Lucy to be euthanized. The couple agreed to take Lucy in, initially thinking that she could be adopted by a physical therapist so that her handicap and outgoing personality could be used to encourage children with disabilities in their own rehabilitation. During the days of hard work that went into keeping her on a strict "potty" schedule after every meal so she could be house-trained, the Rudds fell in love with Lucy and adopted her as a permanent member of the family. Lucy requires almost no special care now, the Rudds say, other than to be helped climbing up stairs. She walks using her strong front legs, pulling her rear legs behind her. For long walks, Lucy rides in a modified jogging stroller. The Rudds also have a sled Lucy uses during the winter months. "She loves to do all the things that normal dogs do. She swims, plays with tennis balls, and wrestles with her brother Ben," Rudd says. Because the Rudds believe that Lucy was saved for a purpose, they pursued their idea of using her to help others. It took about a year of working with Lucy, socializing her with other dogs and people, especially children. Now that she's certified with TDI, she can work in any hospital or nursing home in the U.S. or Canada. Rudd states that he has two missions for Lucy. The first is to increase public awareness that special needs dogs can be a valuable addition to households. The majority of these dogs, which may have seizures, amputated limbs or paralysis are euthanized. "I want to let people know that it's very rewarding to adopt these dogs, probably more so than a normal dog, because she (Lucy) appreciates every day. Having Lucy has enriched my life, and made me appreciate things I've taken for granted in the past," Rudd says. Having been a member of YGRR since 1989 and serving on the Board of Directors for the past eight years, Rudd says he hears about all the Goldens who need homes, especially the ones with problems. He says YGRR takes dogs that are turned in, evaluates them medically, spays and neuters them and places them on a waiting list to be adopted. 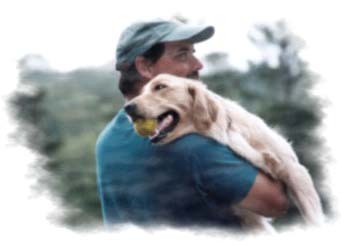 He has rescued four Goldens himself (including Ben and Lucy), which he trained to be therapy dogs. Rudd's goal is for Lucy to continue to help those who need her. "I just think she has a lot to offer, with how she copes with her disability and her cheerful disposition." Besides his full-time job, and part-time snow plowing, Rudd spends from one to 20 hours per week as director of transportation for YGRR. In that position, he is in charge of transporting dogs from shelters and kennels to Hudson, Mass. He also volunteers for the car donation program in which cars are given to non-profit agencies for tax credit." I stay busy," he says. The rescuer and his wife used to visit Northeast Rehab weekly, spending from one and one-half to two hours with the patients. However, because of the time and distance required to get there, they were unable to maintain that schedule. "My regular work duties, plus the ever increasing demands on me for my time with YGRR have caused us to try to focus on local areas," according to Rudd. He also says he made a New Year's resolution to get more involved with local visitations. His motivation for giving back so much to the community comes from wanting to spread some of the happiness his pets have bestowed on him. Recently, Rudd applied for his dogs to be part of the P.E.T. Project (Pets and Elders Together) at Rockingham VNA and Hospice. Jack Haynes, social work program manager for the agency, says that approved pets (and their owners) visit long term care and rehabilitation facilities as well as going to the homes of elderly clients who are housebound. Haynes says interacting with the pets often brings back memories for the elderly. "They enjoy them an awful lot." In the rehabilitation setting, pets can be used to spur patients on to work with physical or occupational therapists, Haynes says, adding that he will be working with Rudd to find out where he is most interested in visiting and what his schedule in. He will then be placed on a regular schedule. "I want to work with people that need her (Lucy) and help her to help people," says Rudd, who never misses an opportunity to provide assistance and hope. HAMPTON FALLS - The work of local pet therapist Chandler Rudd appears in a new book about the healing power of pets, "Therapy Pets: The Animal-Human Healing Partnership." The book was published in June by Prometheus Books, Amherst, N.Y. In it, Rudd, a Hampton Falls resident, tells the story of his golden retriever, Lucy, who was found in a garbage bin at 5 weeks old and left to die. The pup had been born with spina bifida. Rudd, who belongs to the Yankee Golden Retriever Rescue, adopted her and another golden retriever, Ben, who had been chained outdoors for eight months and had become aggressive. Both Ben and Lucy are now both beloved pets and pet therapists, having gone through training at Northeast Rehab, Rudd said. A good part of the training is dog obedience to make sure the animals wont nip or bite if theyre pulled by the tail or caught in a bear hug. Lucy gets around in a stroller, and for short jaunts can lift herself up on her front paws to move. Each Tuesday night, the dogs don green vests that say, "Please pet me, I am friendly," and visit rehabilitation and long-term care patients at Exeter Healthcare. Chandler and his wife, Darleen, have been visiting the center for three years. They also visit the oncology wards in hospitals - different hospitals have different policies on allowing visits by the certified pet therapists - and the special education class at the Garrison School in Dover. People respond in amazing ways, Rudd said. "Theyre so happy, they just love the dogs," Rudd said. "Occasionally, Im asked to go in and visit people with brain injuries or who have suffered a stroke." One patient who was unresponsive otherwise reached out to pat one of the dogs, Rudd said. Patients can identify with Lucys infirmities, Rudd said, and feel a special connection to her. One girl got out of her wheelchair after seeing Lucy hop out of hers, Rudd said. "Thats what you see with children," Rudd said. "Lucy connects with them." Lucy sat by the bedside of an 11-year-old girl undergoing chemotherapy at Maine Medical Center. This story is the subject of the chapter in the book on the Rudds and Lucy. The book was co-authored by dog trainer Karen Pomerinke, of Washington, and Jackie Crawford, a clinical psychologist in Moorhead, Minn. Crawford got Rudds name from an e-mail list and asked him to submit a story. Each Labor Day, the dogs get a weekend off, when theyre joined by 500 other golden retrievers in the mountains of Pennsylvania for summer camp. The camp is a fund-raiser for Golden Retriever Rescue. NOTE: You can see more of Lucy and her entire 2 and 4-footed family by clicking here. And, to see a movie clip of Lucy at the 2005 GRCA Nationals, click here.